Fr. Thomas More Garrett, O.P., made solemn profession in the Order of Preachers in 2012 and was ordained to the priesthood by Archbishop Charles Brown, Apostolic Nuncio to Ireland, on May 22, 2015, in Washington, DC. Before entering the Dominicans he practiced law and worked as a Congressional staffer. In private practice, his work focused on mergers and acquisitions, securities offerings and market regulatory compliance. Fr. Thomas More received his JD in 2000 from The Pennsylvania State University School of Law, where he was the recipient of the school’s presidential scholarship and editor-in-chief of its law review. He received his STL from the Pontifical Faculty of the Immaculate Conception at the Dominican House of Studies in Washington, DC in 2015. During his time in priestly formation, Fr. Thomas More worked in the General Counsel’s Office of the United States Conference of Catholic Bishops and as an assistant to the chaplain of the US House of Representatives. 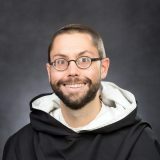 His recent scholarship has appeared in the Journal of Catholic Social Thought, the Journal of Church and State and the Review of Social Economy. Fr. Thomas More currently lives in Providence, Rhode Island, where he serves as Associate Vice President/Associate General Counsel of Providence College. More from Fr. Thomas More Garrett, O.P.